A sensitive altimeter is an aneroid barometer that measures the absolute pressure of the ambient air and displays it in terms of feet or meters above a selected pressure level. The sensitive element in a sensitive altimeter is a stack of evacuated, corrugated bronze aneroid capsules. [Figure 5-3] The air pressure acting on these aneroids tries to compress them against their natural springiness, which tries to expand them. The result is that their thickness changes as the air pressure changes. Stacking several aneroids increases the dimension change as the pressure varies over the usable range of the instrument. Another configuration of the altimeter is the drum-type. [Figure 5-5] These instruments have only one pointer that makes one revolution for every 1,000 feet. Each number represents 100 feet and each mark represents 20 feet. A drum, marked in thousands of feet, is geared to the mechanism that drives the pointer. To read this type of altimeter, first look at the drum to get the thousands of feet, and then at the pointer to get the feet and hundreds of feet. 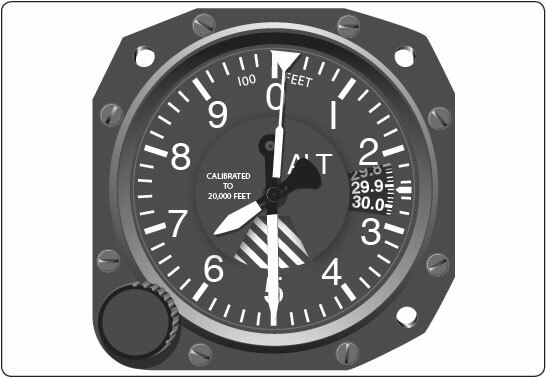 A sensitive altimeter is one with an adjustable barometric scale allowing the pilot to set the reference pressure from which the altitude is measured. This scale is visible in a small window called the Kollsman window. A knob on the instrument adjusts the scale. The range of the scale is from 28.00 to 31.00 inches of mercury (“Hg), or 948 to 1,050 millibars. Rotating the knob changes both the barometric scale and the altimeter pointers in such a way that a change in the barometric scale of 1 “Hg changes the pointer indication by 1,000 feet. This is the standard pressure lapse rate below 5,000 feet. When the barometric scale is adjusted to 29.92 “Hg or 1,013.2 millibars, the pointers indicate the pressure altitude. The pilot displays indicate altitude by adjusting the barometric scale to the local altimeter setting. The altimeter then indicates the height above the existing sea level pressure. A sensitive altimeter is designed to indicate standard changes from standard conditions, but most flying involves errors caused by nonstandard conditions and the pilot must be able to modify the indications to correct for these errors. There are two types of errors: mechanical and inherent. A preflight check to determine the condition of an altimeter consists of setting the barometric scale to the local altimeter setting. The altimeter should indicate the surveyed elevation of the airport. If the indication is off by more than 75 feet from the surveyed elevation, the instrument should be referred to a certificated instrument repair station for recalibration. Differences between ambient temperature and/or pressure causes an erroneous indication on the altimeter. 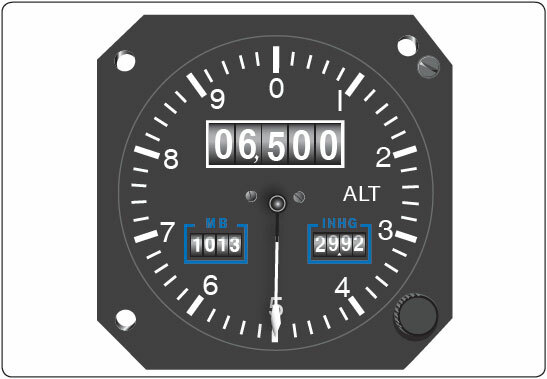 A correctly calibrated pressure altimeter indicates true altitude above mean sea level (MSL) when operating within the International Standard Atmosphere (ISA) parameters of pressure and temperature. Nonstandard pressure conditions are corrected by applying the correct local area altimeter setting. Temperature errors from ISA result in true altitude being higher than indicated altitude whenever the temperature is warmer than ISA and true altitude being lower than indicated altitude whenever the temperature is colder than ISA. True altitude variance under conditions of colder than ISA temperatures poses the risk of inadequate obstacle clearance. Figure 5-7. International Civil Aviation Organization (ICAO) cold temperature error table. Altitudes specifically assigned by Air Traffic Control (ATC), such as “maintain 5,000 feet” shall not be corrected. Assigned altitudes may be rejected if the pilot decides that low temperatures pose a risk of inadequate terrain or obstacle clearance. If temperature corrections are applied to charted IFR altitudes (such as procedure turn altitudes, final approach fix crossing altitudes, etc. ), the pilot must advise ATC of the applied correction. The cold temperature induced altimeter error may be significant when considering obstacle clearances when temperatures are well below standard. Pilots may wish to increase their minimum terrain clearance altitudes with a corresponding increase in ceiling from the normal minimum when flying in extreme cold temperature conditions. Higher altitudes may need to be selected when flying at low terrain clearances. Most flight management systems (FMS) with air data computers implement a capability to compensate for cold temperature errors. Pilots flying with these systems should ensure they are aware of the conditions under which the system automatically compensates. If compensation is applied by the FMS or manually, ATC must be informed that the aircraft is not flying the assigned altitude. Otherwise, vertical separation from other aircraft may be reduced creating a potentially hazardous situation. The table in Figure 5-7, derived from International Civil Aviation Organization (ICAO) standard formulas, shows how much error can exist when the temperature is extremely cold. To use the table, find the reported temperature in the left column, and then read across the top row to the height above the airport/reporting station. Subtract the airport elevation from the altitude of the final approach fix (FAF). The intersection of the column and row is the amount of possible error. Example: The reported temperature is –10 degrees Celsius (°C) and the FAF is 500 feet above the airport elevation. The reported current altimeter setting may place the aircraft as much as 50 feet below the altitude indicated by the altimeter. When using the cold temperature error table, the altitude error is proportional to both the height above the reporting station elevation and the temperature at the reporting station. For IFR approach procedures, the reporting station elevation is assumed to be airport elevation. It is important to understand that corrections are based upon the temperature at the reporting station, not the temperature observed at the aircraft’s current altitude and height above the reporting station and not the charted IFR altitude. The Minimum Procedure Turn Altitude of 1,800 feet is used as an example to demonstrate determination of the appropriate temperature correction. Typically, altitude values are rounded up to the nearest 100-foot level. The charted procedure turn altitude of 1,800 feet minus the airport elevation of 500 feet equals 1,300 feet. The altitude difference of 1,300 feet falls between the correction chart elevations of 1,000 feet and 1,500 feet. At the station temperature of –50 °C, the correction falls between 300 feet and 450 feet. Dividing the difference in compensation values by the difference in altitude above the airport gives the error value per foot. In this case, 150 feet divided by 500 feet = 0.33 feet for each additional foot of altitude above 1,000 feet. This provides a correction of 300 feet for the first 1,000 feet and an additional value of 0.33 times 300 feet, or 99 feet, which is rounded to 100 feet. 300 feet + 100 feet = total temperature correction of 400 feet. For the given conditions, correcting the charted value of 1,800 feet above MSL (equal to a height above the reporting station of 1,300 feet) requires the addition of 400 feet. Thus, when flying at an indicated altitude of 2,200 feet, the aircraft is actually flying a true altitude of 1,800 feet.